Since we were all stuck at home today due to weather, we mainly took it easy. But Z also spearheaded getting a tidying task that we wanted done started. 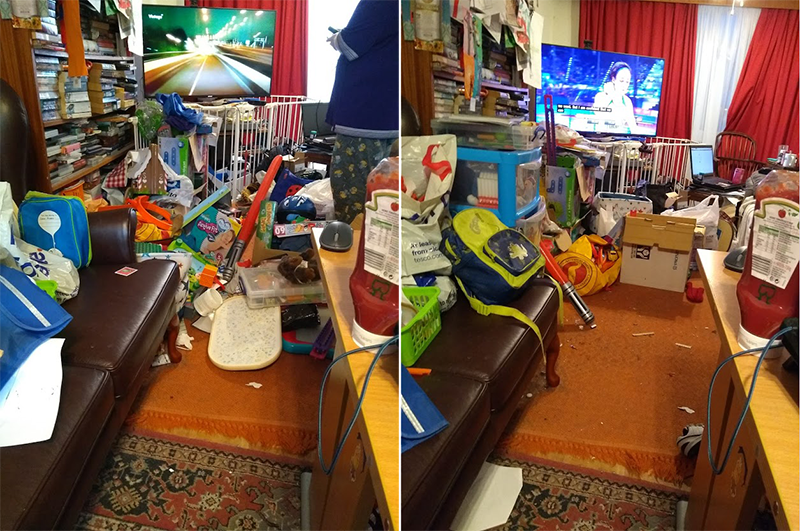 We’re not completely done processing the junk into less junk, but we’ve managed to throw quite a few old toys away, in addition to rubbish that had hidden itself amongst other things (as rubbish does in a busy, child-filled house). And bonus, the girls actually did a proper job of helping out. We have so few spoons between us that things like teaching the girls how to clean properly doesn’t always get covered, so I was happy that we had some success today. For the most part today, I’ve been grinding levels in Diablo 3. Smalls let me do a knitting lesson yesterday, and she knows that she has an open invite to do the same again today. I should probably lean on her when I’m at a natural stopping point in my gaming… tomorrow or something, ha ha. I just realised how late it is (as in, nearing their bedtime). Maybe tomorrow then.